This information is arranged from simple in the beginning to more complex towards the end. The video about the Pre-Dimensional Palette is towards the bottom of the page. In a long stretch teaching in the community trenches, color proved to be the most difficult element of painting for students to handle effectively in oil. For the simple reason that it is so exciting. At this point we are blessed and cursed with a tremendous variety of brilliant permanent colors compared to older painters. It's not easy to know which of those 127 tubes at the store are the right ones. Because all colour is relative to context, there are no bad colors, just bad palettes or unfortunate associations. But because there are so many choices, there are many unfortunate associations possible, and the impassioned modern painter is only too apt to substitute a variety of scintillating pigments for the art of color mixing. This can easily lead to chromatic anxiety disorder. For any kind of painting, learning to manipulate color within the logic of light is similar to developing legible handwriting: a prerequisite to clear communication. Painters interested realistic light, in harmony, and the development of the feeling of a specific place and time, learn to limit the palette and pay close attention to the pigments chosen for a given subject. Luckily, painters have been doing this for centuries and there are specific working patterns to learn from. Pigments, like people, have complex personalities, and complex interactions. These typically take time to learn intimately. But this intimacy is also the foundation of the realistic depiction of form and light. In spite of the need most painters feel to have a tube of every color imaginable, some pigments have proven more useful than others. The ones that are most useful to the daylight process are typically well-known, and may be considered prosaic or boring. However, unique color from the tube can easily put the cart before the horse in use. When color is used correctly in realism, no pigment is in fact discernible because the illusion of light is complete. Many more recent pigments or special boutique colors have strong personalities, and are difficult to integrate into the ensemble. 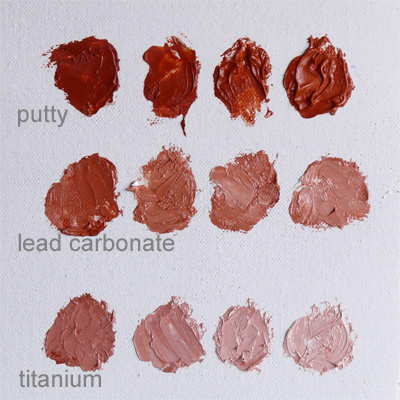 A palette can become so boutiqued that it quickly makes mud. Older painters often chose to use lower chroma earth colors, and developed a system of augmenting color temperature by the careful differentiation of transparent, translucent, and opaque color going from dark to midtone to highlights. The strength of titanium white in the modern palette works against this: modern painting could be told as the story of the many ways painting attempted to adapt to a blizzard in a tube. Ultimately, the way color is utilized is a matter of personal choice. How to simplify the chaos of color complication, and just make paintings that work? The colour wheel provides a standard visual way to explain basic colour relationships, and to plot the relative chroma of pigments. It does not, however, fully illustrate the ways in which colours are modified or attenuated, or contain a guide to the ways these mixtures are organized within the basic framework of highlight, midtone, and shadow to imitate three dimensions on the flat surface of the painting. As such, the colour wheel is not a functional mixing tool for realism. Using it this way tends to contract the range of colour dynamics greatly, and easily results in unnatural looking beauty contests in which an abundance of midtone colours are competing for the eye's attention. By its very design, the colour wheel de-emphasizes the more neutral colours which make up a significant portion of any scene, and serve to provide natural enhancement for the brighter colours. All realistic colour models -- Ostwald, Munsell, etcetera -- are three dimensional and more or less spherical. The colour wheel is merely a slice from the exact middle of one of these models. Given the modern interest in colour for its own sake, it is no surprise that these are the brightest colours. But conceptually, the number of slices in any model approaches the infinite. This means that the dynamics of colour can be extraordinarily subtle and varied. How many of these slices are available in practice is a function of how well the painter can mix colour and the painter's developing visual threshold about value and temperature relationships. It is important to keep in mind that all colour is relative to its context. The brightest colour is that which emerges from a more subdued or neutral context, not the one with the most chroma out of the tube. Over-emphasis on midtone colour is wearying to the eye for the simple reason that it is unnatural. Conceptually, only three colors are needed to give an effective sense of light and shadow in a flat plane: the primaries. While red and yellow are relatively warm, and blue is relatively cool, each primary also comes in two varieties: warm and cool. A controlled shift across the color wheel between warm and cool, coupled with shifts in value, establishes the illusion of dimension. Uncut color makes mid to dark values that are relatively warm. Color cut with medium makes lighter values that are relatively warm. Color cut with white makes lighter values that are relatively cool. White operates as the lightest shade of blue. A palette containing two triads of primaries -- one warm, one cool -- and white, will make countless colors without straying too far from harmony, or atmosphere, the envelope of the day. One simple trick with this system is to mix a neutral dark that can be used to cut the relative sweetness of the midtone colour. Various combinations of pigments can be shuttled in and out of this system to suit the painter and the subject, but a limited number of pigments helps -- forces -- the painter learn to mix more closely, which is the key to accurate, deeper, or simply more pleasing color. The concepts here are discussed in more detail below. A painting is fundamentally a dynamic composition of monochrome values executed in color. If the composition doesn't work in monochrome, the addition of color, however sublime or inspired, will not solve it. For two decades I saw students struggle heroically to prove that oil paintings can be made spontaneously without any form of planning or organization. While the element of spontaneity is very important to art, it is only relevant after the craft of turning color into light and form in all its logical complexity has been mastered. It is crucial to be able to translate color into value first, because all systems of making paintings begin by stressing the larger shapes and light-to-dark relationships. For centuries, in myriad different systems, color has been added to form, not used to make form. This is not to say it can't be done: Matisse certainly did it. But he did it after mastering traditional painting, and as his use of color for it's own sake increased, his rendition of form became increasingly two dimensional. It had to. When we talk about the value scale, we mean the various increments between the darkest dark and the brightest bright in a painting. Learning to see value means learning to see the relative lightness or darkness of an area rather than it's actual color. This is important because it allows you to interpret an idea in monochrome first rather than trying to juggle composition, value, and color all at once. Value scales can be long or short, attenuated or compressed. Old paintings often contain value scales which expand as they go from dark to light: fewer dark values, more light ones. This quality is called relative contrast. If a value scale is long but also compressed, you have a painting with high contrast. If a value scale is both short and stretched, you have a painting with low contrast. Value is a kind of visual accordion that you learn to play, pushing and pulling the brights and darks around until you have what you want. Older painters often exploited the dramatic potential of value to make a limited palette feel more colorful, a more recent painter to do this was Hammershoi. Impressionists, on the other hand, often compressed the value scale in order to use more chroma -- brighter color -- effectively. Typically, a painting will stress value or color but not both. Doing both begins to make the sense of space more questionable because bright colour is necessarily concentrated in the midtones. Great painters such as Bonnard, Sargent, Vermeer, or Titian have, however, combined these approaches in various ways. The color wheel is divided down the middle vertically at neutral yellow and neutral purple, the orange and red half being called warm, and the blue and green half being called cool. These terms, however, are relative: scarlet being a warmer red (closer to orange) than crimson (closer to blue). In theory the warmest color is reddish-orange, the coolest is blue-green, but in practice this doesn't matter particularly because warm and cool colours are used in pairs that accentuate their vivacity through simultaneous contrast. In painting, light and dimension are created by a warm-cool opposition operating across a value scale determined by the intensity of the light and therefore the shadow. A typical older formula of thinking about color says that the lights are cool and the shadows are warm. As the layers develop, the darks get darker and warmer, the lights get cooler and lighter. But in practice this quickly becomes too simplistic, and results in a frustrating lack of internal dimension. Why? Because the warm-cool shift is more than linear, in fact each value is capable of dimension, so each value can contain a warm-cool shift. While shadows may be relatively warm, and higher values relatively cool, there must be some relevant attention paid to the subsidiary shifts: cooler reflections in warm shadows, warmer demi-shadows in the cool higher values. A more natural model for envisioning the behavior of warm/cool movement within value recognizes that the illusion of dimension is the result of both a shift in value and a shift in temperature. The number of values so treated is up to the painter: many older paintings give only a fleeting impression of temperature shifts in the darks if that, concentrating instead on a high degree of accuracy in the subject. But dark shadows contain cooler reflections, if it works pictorally to put them in. Similarly, the values on either side of the famous cool midtone must be relatively warm or a false flatness results. 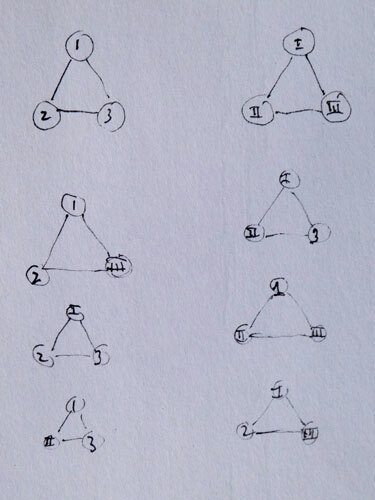 The painter controls the number of values depicted, the number of shifts from warm to cool and back as the values change, and their relative emphasis. Some painters put it all in, others have created more artistic or personalized versions of the logic. This is also how paintings can be made "magically" ultra-realistic. A system of controlling and manipulating the actual dimensionality of a painting can be seen in action in many Rembrandt paintings, especially something consciously dramatic like "Belshazzar's Feast". Using this serpentine approach to the warm/cool shifts across value allows more latitude and freedom in the way of color development, and ultimately leads to a clear abstract understanding of the way color makes light. The simplest way to conceive of this is in terms of a triangle of red-yellow-blue being needed to create a sense of dimension within a given value as well as within the painting as a whole. Each value, therefore, has its own potential colour wheel, the midtones containing the most colour choice, the darker and lighter values the least. In practice this becomes more complex because of the way both shadows and highlights are influenced by surrounding color. In both shadows and highlights there are elements of absorption and reflection. Warm and cool are relative terms: ultramarine and phthalo are both blues, but ultramarine is warmer and phthalo is cooler. Thinking this way is important for constructing a balanced palette as well as for interpreting what's going on at a given time with the light. In daylight, for example, there are often times when its really a toss-up whether the light is pale yellow or pale blue. It doesn't matter which you pick just as long as your shadows and midtones are painted consistently with that choice. Blue light requires warm shadows, yellow light requires an element of purple in the shadows. This purple can be, but does not have to be, exaggerated, it can be made -- for example -- with burnt sienna or Mars violet and the blue of the sky. Also, remember that white operates as a shade of blue, so the use of white in the highlights needs to be balanced by orange in the shadows. This was often seen in older painting in a transparent dark warm color which formed the basis of the shadow structure, allowing the light to be pure white. 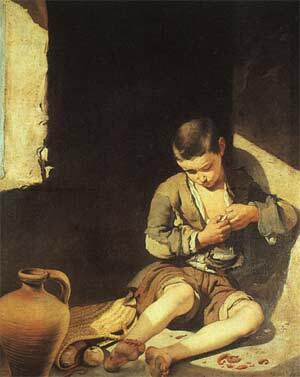 The use of pure white to make light with blue shadows is a common student error, resulting at best in the pastel unity of Titaniumism, but without a convincing sense of light, dimension, or place. The logical chromatic partner of white light is a brown shadow structure, this was done for centuries as a way to simplify execution and concentrate on midtone colour. A specific set of colours will often be used to make shadows. A good example of this for daylight painting is ultramarine and burnt sienna. When mixed together, they produce a relatively neutral dark. But the logical partner of this shadow is not pure white, but yellow light. A painting executed in daylight has one color bleaching all the highlights and one corresponding opposite color enriching and integrating all the shadows. The brightest or most unbroken colors are in the midtones, but these too have subtle shifts: the absolute middle of an upright cylinder in daylight contains a cool midtone: the lighter tone on one side is warm, the darker tone on the other side is also warm, and warmer. Each value in the painting has the potential for this type of shift, usually they are more developed in the midtones and highlights. The painting can also be influenced by the atmospheric envelope of the day. 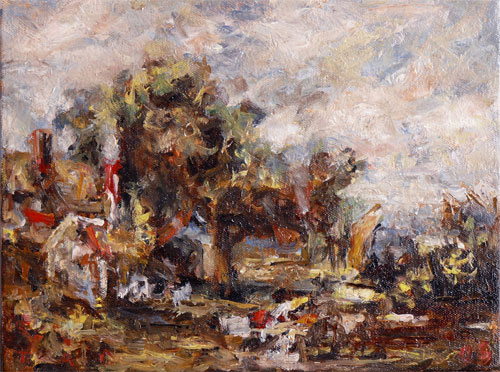 This has been especially exploited in landscape by painters such as Turner, Corot, or Monet, who learned to exaggerate the effect of atmospheric recession on the local colors. By painting with a specific cool-warm axis in mind from the beginning you will be able to add local color to the warm-cool harmony of the day, rather than trying to find each color individually and mix it correctly. It is much simpler to paint from the envelope first: identity or local color goes on top of atmosphere, inevitably resulting in a certain charismatic essentialization. Of all the things one might explain about landscape especially, this is among the most important: to learn to see color through the atmospheric lens of a specific day rather than trying to find each color separately. A way to help yourself find the envelope is to work with a limited palette. How few colors can make the scene? What is really crucial? Once the less-is-more approach to the palette has been learned, the participants can be varied and even expanded. Light never does anything illogical. If it did our lives would be impossible. Light has rules and they are invariable if often subtle in operation because of the intense relativity of color, and the way colors interact. The primary colors of light in painting are red yellow and blue. In this equation both black and white operate as shades of blue. The illusion of dimension in any painted scene is created by the interaction of value -- light to dark -- and temperature: the shift from warm to cool. The temperature of the light and shadows are opposites. Cool light means warm shadows; warm light means cool shadows. The more warm or cool the source of light, the more cool or warm the shadows. If the light comes from everywhere, such as at dawn or at twilight after sundown, an overall tone -- cool, in these cases -- is moderated by warmth in the shadows. (If you look at paintings from this point of view you can see the many ways that painters have played with the possibilities here over the centuries. The many varieties of Twentieth Century realism all use purposeful distortions of this principle). In practice this means that if you are using white (a shade of blue) to make highlights, your shadows need to contain some form of orange. If your white also contains yellow, your shadows also need to contain purple. If your white contains orange, your shadows need to also contain blue. This explains the complexity of color in shadows but becomes more simple if you memorize the basic opposite color pairs on the color wheel. Once you start doing this and see it work in practice it quickly becomes automatic, and is typically a matter of getting the shadows to lie down or recede in relation to a given set of higher values. The midtones contain the most pure colors: the highlights contain white and possibly another color, the shadows ideally contain no white and the opposite colors to the highlights. The more you can keep white corralled to only the highest values, making as many tones as you can transparently -- without white -- or with lighter value colors that have a certain opacity, the more lively and vivid your painting will be with an easier to control, limited palette. Painting this way enables you to paint the light first and foremost, with the detail or identity of things coming second. This means that your paintings will be inherently organized around the color axis or envelope of the day and time you're painting, making them intrinsically realistic without the potential weighty baggage of detail. Painting this way allows you to control the level of detail by always working from big towards small, dark towards light, warm towards cool. Older painting often exploits the relative warmth of transparent pigments in relation to the relative coolness of pigments mixed with white. The darker transparent tones have a physical recessive depth while the lighter opaque tones appear closer or on top. Older paintings were often begun transparently, with opaque higher values placed on top of transparent darker ones. Midtones are made with a minimum of white, the cool midtone is a subtle but important part of still life and portrait/figurative work, occurs a little more randomly or creatively in landscape. As one approaches Impressionism on the timeline of painting, flat passages of color are broken up more and more using chromatic opposition in a relatively discreet way. This system, from transparent to pellucid to turbid to opaque, creates the maximum illusion of depth and light by exploiting the relative optical warmth of transparent paint and the relative optical coolness of any paint mixed with white. Subsequent layers of the painting continue in the same way. A simple way to think about this type of painting is to try to concentrate the use of white into the upper quarter -- or so -- of the value scale, and to use a second triad of primaries that are lighter and somewhat opaque to make shifts in the midtones. It is much harder to do this with titanium white, which is ten times more opaque than the lead white of older painting. However, titanium white can be effectively cut with the putty medium. A great many paintings have been made over the centuries based on warm earth colors such as yellow ochre, venetian red, and burnt sienna, used with the cool colors black and white. Handled well, the interaction between warm and cool in these paintings more than makes up for their relative lack of what is thought of in modern terms as color. 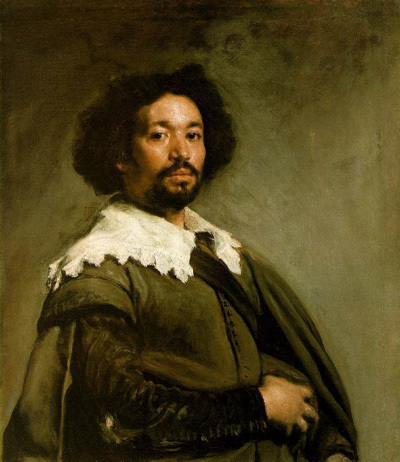 This is the palette of cave paintings, many Renaissance frescoes, and work of painters such as Rembrandt, Velasquez (above), Hammershoi, and Murillo, below. There are many subtle variations possible here. The most important thing to stress about the earth colors is to get the best. If you use commercial paint, the best earth colors are made by Maimeri and Blockx; Old Holland and Williamsburg have good pigments but use a linseed oil which, in my experience, yellows more. Please don't think that an old tube of student grade "Venetian Red" has any relationship to Blockx Venetian, or to the Venetian pigment sold by reputable sources. I've seen many students shocked by the difference between a quality earth color and the student grade, which can be perceived of as good enough because dirt is dirt. In reality the difference is dramatic, and costs at most a few more dollars per tube. This is more genuine economy. Above is an example of a simple three color palette made with Ivory Black, Red Earth, and Yellow Ochre. If you make some examples of the secondary colors in this three color situation color mixing becomes easier. Mixing a few example values of each color with white is helpful: more if you're using a higher chroma triad.. The great thing about this exercise is it teaches the validity of color relativity clearly, and the way realistic color harmony springs from the interaction of color. The gray made by black and white in this situation looks unnervingly blue, especially if it's anywhere near it's chromatic opposite, orange. Older painters made constant use of the way complements make one another appear brighter. 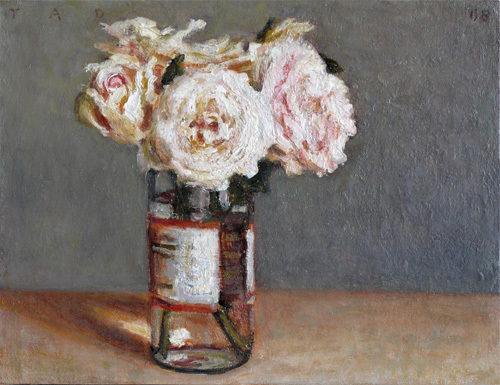 Below is a small study of heirloom roses done in the same set of colors. 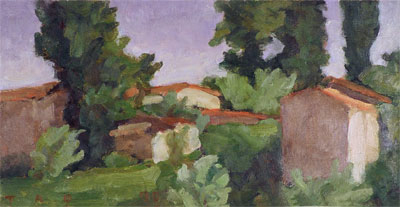 When using a limited palette, the putty medium offers a type and subtlety of color manipulation not possible otherwise. Set up shows Venetian Red about to be cut progressively with chalk putty, lead white, and titanium white. The chalk putty creates lighter values in more discreet increments than either white, and they are warmer by far. These are values that can be achieved in no other way, explaining how painters such as Rembrandt or Velasquez were able to do so much chromatically with the limited palette. Note the pronounced color-obliteration and blueness of uncut titanium in comparison. This effect can be ameliorated to some extent by pre-cutting titanium white with putty before use. The putty medium can be configured in many ways. 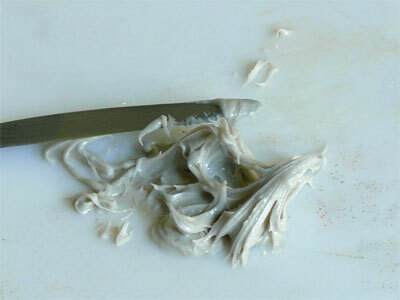 It will make paint which is thin and smooth as well as paint which is rough and broken. It acts both physically and chemically to stabilize the paint film. It is a solvent-free painting system, brushes can be kept on their sides in oil as documented in earlier painting practice. Almost all work on this site from the last three years is made with the putty medium exclusively and no additional resin. This is an extremely versatile and tough material. More putty history and instructional text to be found here. 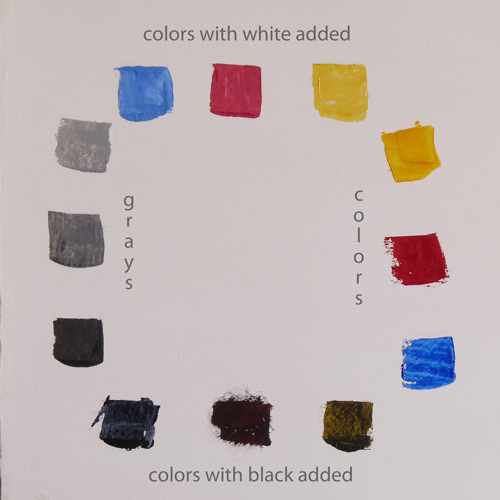 Older paintings by painters who used a chalk medium often exhibit a technique for maximizing the chromatic shift available from a palette of relatively low chroma earth colors, black, and white. 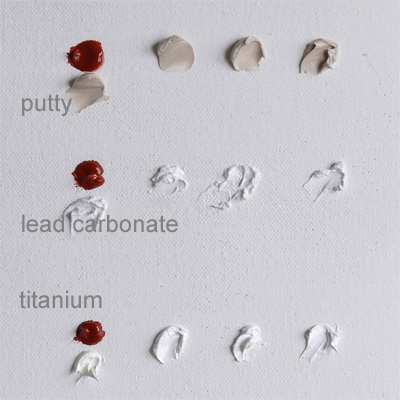 This technique involves using the warm colors -- yellow ochre, raw sienna, venetian red, burnt sienna, and including black -- without white, the lighter values of these colors being made by the chalk putty medium. A layer of these goes down first, followed by a cool, opaque layer using only black and white. By controlling the amount in which these distinct warm and cool layers remain separate or blend together through the putty medium, a great deal can be accomplished in one layer while keeping the color, value, and temperature clean. The eye perceives more chroma because of the exclusion of white from the warmer values. As with any technique, more is possible through experience and practice. 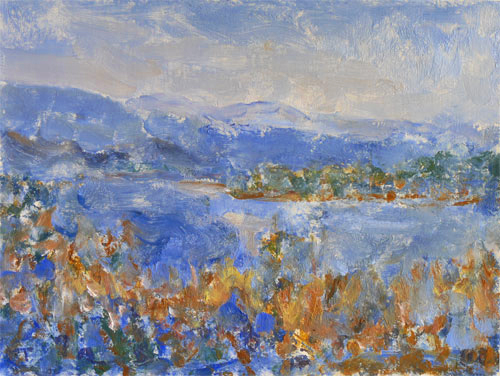 A common atelier method exercise is to make a painting with two opposite colors and white, typically a quality burnt sienna and a neutral ultramarine. Let's look at how much color this can make using the putty medium. First, make up a neutral dark mix of ultramarine and burnt sienna. Then make up twelve values of this using the putty medium and divide each into two. Add a very small amount of white to each value in one set of twelve. This gives a set of warm/translucent and cool/opaque grays. Then do the same twelve value division with the two colors, giving the same warm/translucent -- cool/opaque options. Pre-mixing to this extent gives 72 different colors to work with from the original three. Further subtlety can be pre-mixed as well if need be. The degree of control available to this system, even without actually pre-mixing to this unusual extent, is significantly greater within a single layer of paint than what can be achieved without the putty medium. An interesting aspect of older painting is the documented use of very small palettes. The conjecture that this might mean the colors were mixed on the painting, not on the palette, is supported by the writing of Samuel van Hoogstraten, a pupil of Rembrandt. This efficient method is discussed in depth here in the second half of the text. There are many ways in which color can be premixed on the palette to help the painter get a better understanding of the potential of the palette in relation to the subject before the painting begins. A set of lighter tones made using white will encourage the avoidance of pure white. A series of chromatic grays, or simply grays made with black and white, in a few or many values, can also be used to create a cool element. A mirror image of the palette mixed with black or a chromatic -- mixture of red, yellow, and blue -- black will also help keep the painting balanced between warm and cool. These options are illustrated schematically above, much more could be done. Once these simple mixes are made, they can be used to create a set of specific colors for the painting. There have been many color theories proposed over the centuries, to the extent that they provide a study of their own. There's now lots of information about colour on the internet. All of this is interesting to explore, and offers certain general guidelines which are useful. Certainly, to think in color, you need to think three-dimensionally: challenging but ultimately more fun. But as a painter, you are dealing with color practice in order to make art, and in fact need to think in a fourth dimension as well, that of time, what goes on where and when. Another pretty significant issue is that no theory or chart deals with the personality of pigments. Practice is always more complex than theory in word, but simpler than theory in deed. Over time, one learns a system which is functional and expedient. Understanding a dozen pigments and their interaction is more valuable in use than understanding a dozen theories. For this reason, it is often possible in older paintings to see painters organizing the palette around one or two triads of color in addition to white. There are many working variations of this concept, but the general idea is to create the most potential color variety from the fewest number of pigments that will serve for a given painting. This allows easier access to the close color harmony that is always part of any natural scene in daylight. Triads of red yellow and blue can be warm, cool, or mixed. Many painters have tried to come up with an optimum triad of red, yellow and blue in order to create the simplest color mixing. I've seen several paintings from the 20's using cobalt blue, vermilion, and yellow ochre to make a landscape, it's not that realistic but very effective. Paint manufacturers now make a set of "primaries" which are modeled on the colors of process printing or the inks in a color printer. These colors constitute a Cold Triad, (above), and are all transparent. They will make a great many different colors, including warm ones. Which brings us to an interesting warm-cool conundrum: cool colors will make warm colors but warm colors will not make cool colors. However, warm colors are painter and viewer friendly, and most palettes end up with a triad of both. If you want to experiment painting with the process triad, try breaking up the intensity of the pigments by mixing a palette of secondaries from them as well before beginning, and also mix some colors with an addition of white. Unless using all earth colors, one warm and one cool triad with white are almost always enough to make a painting. The art here is to pick appropriate colors for the mood of the painter and the painting. If you think of the palette in this modular way, you can shuttle pigments in and out of your line-up without creating the ubiquitous chromatic chaos of too many pigments, perhaps familiar from the Local Restaurant School of painting. And this might be a very good thing for everyone's digestion. With a modular palette you are relying on mixing pigments effectively, not on a variety of pigments, so each change in pigment has a dramatic effect on the overall situation. Because light is logical, palette construction needs to follow this logic, and is most often about the relationship between two pigment triads which are opposites in a way that is relevant to the painter and/or the subject. 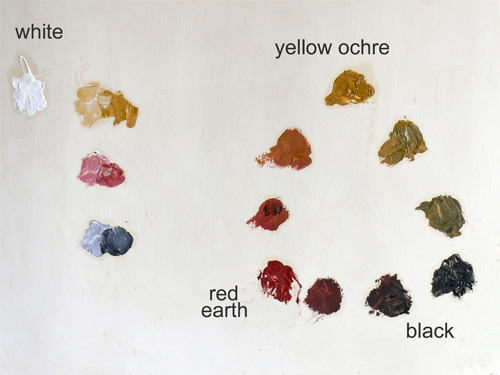 For example, one triad is selected for high chroma, the other for low chroma: this is the palette that most older paintings use, incorporating earth colors (lower chroma) with a high chroma triad like vermilion, ultramarine, lead tin yellow (Vermeer). This can also be thought of in musical terms, the lower chroma colors providing the bass or bed which supports a higher chroma melody. 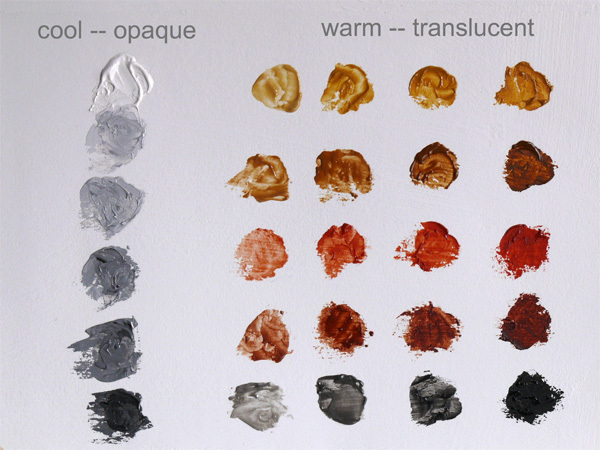 Both triads could be high chroma, but one is warm, the other is cool: Post Impressionist paintings often use this type of palette, as do modern plein air colorists, example on the right. 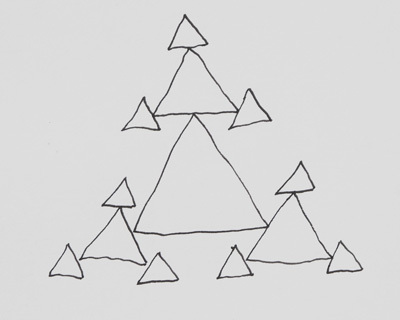 One triad could be primary, the other secondary, with one being low, the other being high chroma. The possibilities here, given the modern variety of pigments, are enormous. But the creative aspect of this relies on selection, on the acceptance of specific limitations that will, paradoxically perhaps, allow for more facility, harmony, and depth in execution. When using high chroma pigments, even less can be more. Monet used several slightly different palettes during his Impressionist heyday but the one he spoke of as his standard consisted of only five pigments. From left above: Aureolin (above, transparent, or Cadmium Yellow, opaque), Vermilion, Viridian, Cobalt Blue, Rose Madder. Real rose madder is somewhat hard to get and expensive so you might use Pyrol Ruby Red or an Anthraquinone Crimson there, not Alizarin, if possible. This and maybe using phthalo green for viridian are okay as substitutions but you need real cobalt and real vermilion. This is not an easy palette to harmonize, adding transparent Mars yellow helps a great deal. 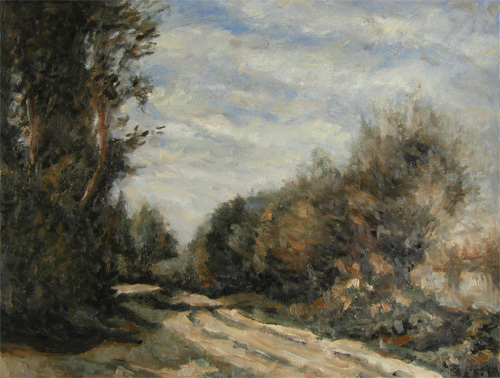 A small copy of Corot's Crecy en Brie Road made using the very limited palette of five colors above. Golden Ochre, Burnt Sienna Light, Green Earth, Cobalt Blue, and Ivory Black. This type of palette was used in many different ways throughout the 18thy and 19th Centuries in making landscapes in the studio and outside. 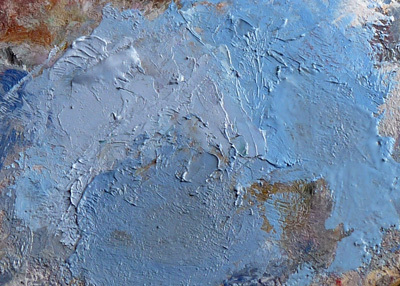 In this scenario situation high quality earth colors make a large cumulative difference. Ironically, Corot's actual palette used the brighter vermilion and viridian: see National Gallery Technical Bulletin No. 30. A palette used to copy Constable's first small study for The Hay Wain has six colors. This is a good example of a ubiquitous traditional palette scheme which uses a higher chroma triad over a lower chroma one, making the available higher chroma colors that much more vivid in context. The low chroma colors here were ivory black, transparent mars red, and transparent mars yellow. The high chroma colors here were nickel yellow, cadmium red, and a mix of ultramarine and phthalo blue. Not historically accurate pigments. A double triad palette I've used outside to get away from the predominance of summer greens. This could be used very brightly but I ended up liking a slightly more subdued version of it, as in the image of Button Bay on Lake Champlain, above. Colors are: nickel yellow, transparent mars yellow, pyrol vermilion, pyrol red, cobalt blue, and ultramarine blue. The higher overall chroma of this palette can take a somewhat more frenetic approach to outdoor work without becoming muddy. The modern palette concept of two integrated traids of primaries is great at making lyrical colour, because it generates four different types of secondaries. This in turn means it tends to avoid the bane of all K-12 art teachers, mud. But, this set up is not great at mapping colour to form realistically for the same reason: it emphasizes the lovely midtones. To the point, just occasionally, of the painting becoming a beauty contest. Even with white involved, it is hard to get at a neutral unless you know that mixing a neutral is going to help you and why. And, you can't mix a dark neutral unless the warm yellow is transparent. (This is why trans Mars yellow is such an important colour.) And unless you know a lot about simultaneous contrast, a neutral is a sure way to make mud. But, in reality, since all colours have a chromatic opposite, there is no such thing as mud, just an unresolved context, i.e., not enough organization in mapping colour to form by type. Here is a way to conceptualize colour more in relation to older painting, especially work by those highly logical Flemings and Netherlanders. In this model there are three types of colour: positive, negative, and neutral. The positive triad is the familiar midtone colours from above. 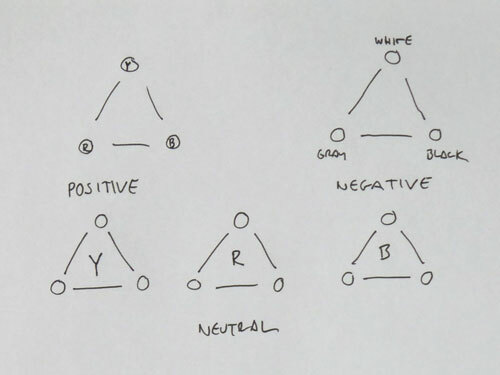 The negative triad is made up of black, white, and gray. This sets up the creation of a set of neutrals easily from each primary. The neutrals are used to make highlights and shadows, making this set up very effective at mapping colour to form. Midtone colour can be amplified or diminished, but it is much easier to get at realistic contrast from this set up because it is organized according to the colour types within form, rather than warm and cool. This is an example of the older method of integrating positive, negative, and neutral colour. In this palette, different types of colour are used for mapping colour to form. Setting up this palette makes it much easier to access neutral colour and work with it creatively because it is seen from the start. Nothing against augmented or artistic colour, but sometimes, natural colour is the only answer. The eye, of course, knows what a natural colour is: it's been looking at them all its life. So I've been making sets of colours to key into a given situation. Sometimes these are chromatic grays, a specific dark for the shadows or the reflections in the midtones, but here I did a set of blues designed to shift the colour of a sky more from red towards green: you'll see this below. In some ways I thought about this, but in other ways I just let my hands make the colour they wanted to make. This is easier, since thinking about colour is pretty taxing, and I'm finding that, having looked at natural colour for so long, if I just trust my eyes, they'll get it pretty close. Each of these blues contains at least two other pigments and white, so, this way of mixing colour is guaranteed to make mud. But, of course, it doesn't because the shifts in value also have a shift in temperature. So, that's been another big lesson recently, that mud is not a function of colour identity, but of colour context. A given set of colours -- shadow, midtone, and highlight -- are used to create the illusion of form. These all have different values, and different temperatures, but are unified by the light-shadow axis of a given day. But, the interesting thing is that the equation of turning colour into form is essentially abstract. So, once you know how to do it, you can begin to do it anywhere, with anything. So, any shadow, midtone, or highlight group that makes form -- represented here by a triangle -- can then be broken down again, into smaller chromatic components that create more of a sense of dimension. If this is used with more in the way of chroma and value, it becomes Impressionism. But if it is used with more finesse in terms of the value and temperature relationships, it is the way colour was used in so much older painting to mimic the vivacity of light in the most inscrutable manner possible. Spontaneous mixing tends to emphasize midtone colours and highlights made with white. Painters who work with realism develop some sort of convention for making shadows such as mixing burnt Sienna with ultramarine. This gives three colour types, although highlights and shadows tend to be relatively generic or flat because they are usually not involved with triadic mixing. There are three possible colour contexts, or combinations of different colour type: highlight-midtone, midtone-shadow, and highlight-shadow. These create a sense of depth, but it is limited. It is difficult for spontaneous mixing to make paintings that actually look natural or genuinely realistic because the system makes certain colour types, and their associated contexts, difficult to find. A more complete analysis of colour types consists of highlights, midtones, grays, shadows, and divides these into two groups, transparent and opaque. This makes a more detailed set of colour types (eight) and a more detailed set of colour contexts (twenty-one). This explains why 17th century painters were able to do so much with a limited palette. 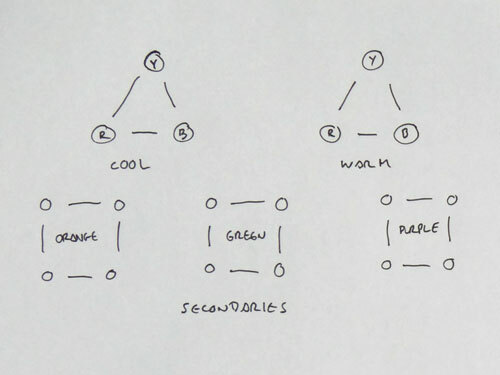 Colour is mapped to form not only according to value and temperature, but by type as well. This advanced awareness of the way colour always exists relative to context allows a great deal of perceptual colour to occur from relatively few pigments. None of the current books about colour address the optical difference between transparent and opaque colour, or the way this creates a more evolved set of colour contexts. Contemporary ideas about colour are being led by digital colour. But the difference between colour made from light and colour made from pigment is significant. Systems based on pigment identity tend to appear more natural in paint than systems based on digital emulation. The way colour is conceptualized conditions the way it is implemented. It's pretty clear from a lot of 17th century paintings that they were made with limited palettes, yet the perception of colour in these paintings is profound. This has to do with the techniques used to map colour to form, using different types of colour for shadow, midtone, and highlight,both in terms of the optical state of the colour, and the way the colours are mixed. As a result of this, the degree of colour perception is radically enhanced in a Rembrandt or a Velasquez compared to a painting made by the more recent literal systems, which a correspondent this week referred to as being based on "digital envy," and which, I admit, have always bothered me. For a while I've been trying to conceptualize what happens with colour in terms of three dimensional geometry but it has seemed too complex for this model. A triad of red, yellow, and blue gives three axes, therefore a sphere, without even adding white, much less more colours. Then I realized that in a palette of two triads -- warm and cool, dark, and light, earth and bright, etc. -- there was a dialogue between the two spheres. But actually, in a palette of six colours, there are eight different triad spheres of red, yellow, blue combinations possible. It is axiomatic in the older books that the best painter uses the fewest colours. This is because the perception of colour is always relative to its context, and context is established by mapping colour to form by type. There are four types -- shadows, midtones, highlights, and grays -- available from any triad and white. These are differentiated by temperature, value, and optical state, i.e., whether they are transparent, translucent, or opaque. In this situation, the orchestration of the colours is potentially much greater than in a digitally-derived system because the system is based on the behavior of pigments first, not on the behavior of light first. Light is the theory, but pigment is the practice. In his Journal, (8-26-54), Delacroix wrote that progress based on machines will end up turning people into machines. The way colour has come to be conceptualized is a good example of this. It's too bad, because colour is an organism, not a mechanism. It is possible to learn a great deal from this organism if the frame of reference is that it is the teacher, not the tool. The Interaction of Color (1963), by Josef Albers is a standard modern text about colour used in painting programs. But in it, in section III, Albers states that paint is too complex a tool for the study of colour. Hello! In his search for colour as a Ding an Sich, Albers prefers coloured paper, for example from magazine illustrations. But a desire for a more standardized teaching tool and a somewhat less fugitive colour source led to the production of the ColorAid set of papers. These are often used to teach the principles of simultaneous contrast, or colour unreliability, that are so much a feature of The Interaction of Color. And this is all fine as far as it goes. But there are two problems with this approach if you are a painter. The first is that, oops, you are using paint. The second is that the paint is made from pigment, and the various pigments have both specific characters, and specific chromatic interactions. Managing all this may well be complex, but it is not really optional. A painting can have great colour theory and still look stilted or unnatural. 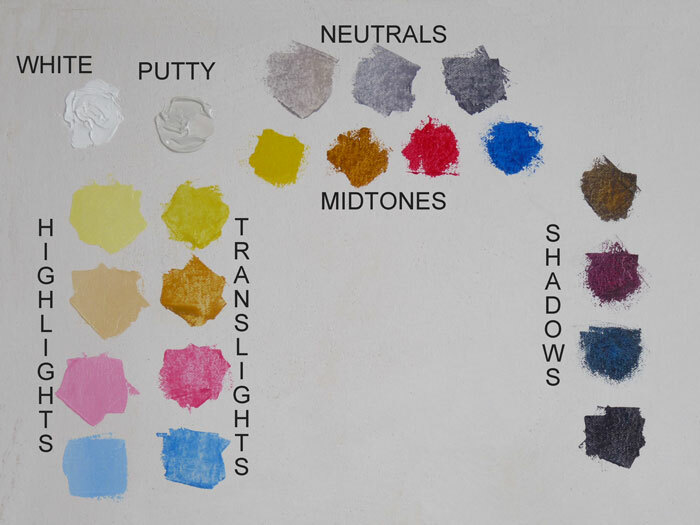 Knowledge of the pigments themselves, and the way a given palette plays together as an ensemble, helps balance theory with the less ideal, but far more practical, facts.